The conversion of organic wastes into vermicomposts and vermicompost ‘teas’ which promote plant growth and suppress pests and diseases. and Arancon, 2004). More recently, there has been considerable world-wide interest and significant technological progress, particularly at The Ohio State University, on the production and optimal uses of vermicomposts. 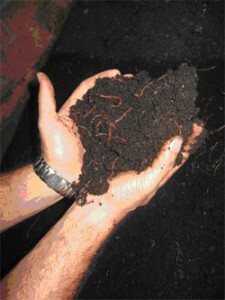 Vermicomposts can be processed from most organic wastes such as animal manures, and particularly, paper and food wastes, through interactions between earthworms and microorganisms, in a mesophilic process (up to 35°C), to produce fully-stabilized materials with low carbon to nitrogen ratios. They have high and diverse enzymatic and microbial activities and contents, a fine particulate structure, good moisture-holding capacity and contain nutrients such as nitrogen, potassium, and calcium in forms readily taken up by plants. Vermicomposts can have dramatic effects upon the germination, growth, flowering, fruiting and yields of most crops, particularly fruit and vegetables, which are high value crops.